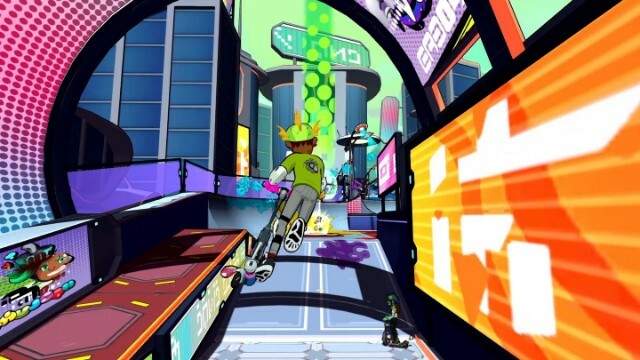 Skating games have a very unique place in the history of video games. They may not be something that many would associate as significant, but the Tony Hawk and Skate series’ would beg to differ, with certain instalments regarded as some of the best games of all time. Now this formula is back, but with a slight twist. Ditch the board, grab some scooters, throw in a bit of Splatoon, and add some cartoon style graphics, and you end up with Crayola Scoot. Crayola Scoot is something that is playable for all ages, and so the controls are fairly simple to pick up. 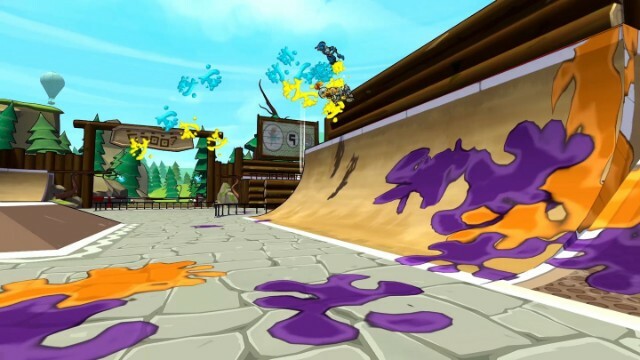 As you whirl through the air, your scooter releases paint, colouring your surroundings with whichever colour of paint you’ve decided to select for your character. You can utilise grinds, flips off ramps and boosts to extend your combos for as long as possible. The more moves you perform in succession, the more points you earn. Adding an element of strategy is the boost meter, which can quickly run out, only refilled by running over paint of your own colour. Another interesting feature are traps placed around the maps, which can activate and spray paint over the surroundings if you land a trick near them. It adds a welcome level of unpredictability to proceedings. Stringing together combos is pretty easy to pick up, although lacks the innate difficulty of some of the more complex tricks found in Skate, for instance. This is easy to forgive though, given the game’s inherent accessibility. As you fire up Crayola, you’re led through a fairly simple tutorial to show you the basics, and then it frees you up to compete in a series of challenge modes played across different locales, which include a series of rooftops, a forest and sci fi themed amusement park. There’s a good variety in the different challenge modes available. Two of them task you with covering as much of the map with your paint as possible; one on your own and another as part of a team. 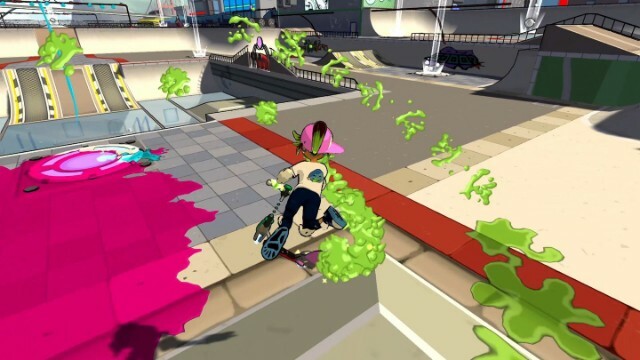 Trick Run is a game type centred around gaining as many points as possible by stringing together combos, while that of Team Splat involves one person being “infected”, while the rest of the players have to avoid this individual. If any of you ever played Infected on Halo back in the day, it’s a lot like that. The least interesting mode is Crayon Dash, which tasks you with collecting as many crayons scattered around the map as possible, seeing you riding around the map following a little marker telling you where the next crayon has spawned. This is easily the game’s worst offering, as instead of taking advantage of the whole point of Crayola Scoot, it uses a bland gimmick to try and get players to do something else. It just doesn’t work. While you can definitely have some fun playing solo, competitive play against your friends is where this game earns its keep. Crayola is fast paced as it is, so adding in other players only heightens the madness, as you all race around desperately trying to cover up each others paint with your own. However you play, all of the game modes last for a maximum of two minutes, so you have to act quickly if you want to come out on top. However, while the content that exists here is well designed and fun the first time you play it, there just isn’t enough of it; there aren’t many maps, and you’ll find yourself battling in the same arenas over and over, which can gets tiresome after a few hours. The problem is what’s not in the game, rather than what is. Every time you play, you find yourself earning experience, which allows you to level up your “fame”. Once you do so, you can unlock new maps, scooter parts and also take on challenges from a variety of bizarre characters the game throws at you, complete with cheesy dialogue. For each of them, you’ll have to win the equivalent of a game of HORSE (appropriately named SCOOT), by scoring higher combos within a ten second timeframe. It’s a fun element, and some of the challenges will require you to be quite accomplished in chaining together combos to beat them. Wiggling the right stick in any direction will make your avatar do some kind of move in the air, and it’s satisfying to figure these out. However, there are times where the AI can fall a bit flat, as some of the characters will crash on certain occasions, gifting you a free point. This can be amusing, but it’s a bit strange when you find an early challenge character giving you more trouble than a later one. Battling these guys though is about as much that Crayola Scoot can deliver in terms of story, with your character aiming to win the Paint Cup by defeating all the challengers. And apart from some limited cosmetic character customisation here and there, adding different clothing items and helmets, as well as altering the colour of your paint splash, that’s about your lot for Crayola Scoot. It is an enjoyable romp, with its frenetic pace and solid competitive play, but it is brief. How long you end up enjoying it for may depend on how many friends you have, especially considering the rather steep £35 price tag.